These two giants make odd bedfellows, but there is some logic in pairing Beethoven's most delicate symphony with Mahler's most deeply personal. At first glance, the last sentence is somewhat silly. There is nothing by Beethoven that could be openly called delicate, and there's nothing by Mahler that doesn't bear a genuine stamp of pathos and depth. But the Fourth Symphony is a work of great beauty and elegance, while the Mahler is perhaps his most moving symphonic creation. Louis Langrée is a conductor whose gifts work well for this music, and the Detroit Symphony sounded magnificent. Under Langrée's excitable and physically involved baton, the Detroit forces gave the Beethoven what some would call an appreciably "French" sound. Lean textures, crisp rhythms, and forward winds recall an earlier style of playing. We tend to think of this fleeter Beethoven because of period-performance practices, but in truth, this music has always responded well to this approach. Additionally, this style ideally suits the current Detroit Symphony. The woodwinds and strings are almost always exceptional, and I must say that the more they play together, the better these brass players continue to sound. I still prefer the orchestra when it plays under guest conductors, but at least I don't get the impression that the horns and trumpets are out of control anymore. This was a wonderful performance of a work that often gets lost in the shuffle of the Beethoven canon. 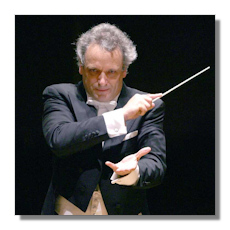 The Mahler was a true test for both conductor and orchestra. Louis Langrée passed, and so did his players. Kelley O'Connor is a well-liked guest artist in Detroit, and it's not hard to see why. She's beautiful, emotionally involved, and her tone is mostly gorgeous. I felt she had a few uncertain moments near the beginning of the work, and maybe some of the quicker music gave her trouble. But my God, how magically she rendered Der Abschied of the piece! Russell Thomas was everything you could wish for in a tenor. He's handsome, charming, and possesses a terrific sound. I especially liked how both soloists were readily audible above the very large orchestra. That's where Louis Langrée impressed me the most. His ability to capture small details, manage a huge dynamic range, and give each section such distinct character was superlative. Many of the same qualities that made the Beethoven so effective could also be observed here. The ensemble was exceptionally balanced. Nothing ever dragged, and no instrument was ignored. I particularly enjoyed how Langrée explored the various moods of the work, from the orientally-flavored tang of the winds to the fine way he handled the percussion and harps. Langrée does most of his work at Music Hall in Cincinnati, and having toured the building I can testify to the similar design and "feel" of the acoustics. I can't say for sure if that played a role, but I can say that here is a conductor who embodies all the finest qualities of the French conducting school. The Detroit Symphony Orchestra is certainly giving some world-class concerts lately, and I'm excited and intrigued to see if they can maintain this new standard of excellence throughout the rest of the year.